For our friend Faith’s 2nd birthday she was really into turtles so her party theme was turtles. We thought a lot about how to shape this cake and make it look real. 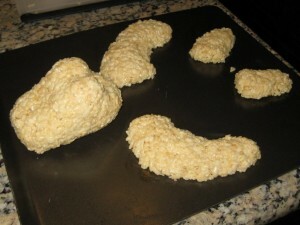 This was our first cake using Rice Krispy treats to shape parts of the body. They worked really well. This was also our first time using isomalt. 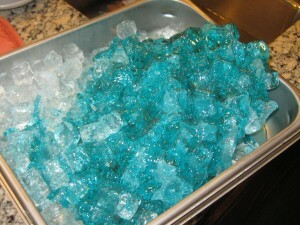 Isomalt is the popular name for Isomaltitol which is a sugar substitute made from beet sugar. Here’s some great information from Make Your Own Molds. We selected this to give a realistic wave and water look. I found it very easy to work with and found it at our local cake decorating supply. We started this cake with 2 rectangular layers of banana nut cake and used a cream cheese frosting. The two layers were frosted in the middle and then carved into the shell shape. 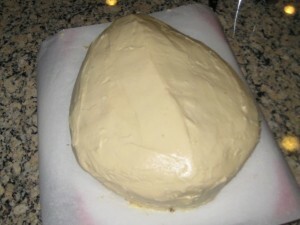 This was then frosted and refrigerated for the frosting to firm up. It is best to always firm the frosting up before applying fondant. We originally planned to carve the turtle head and legs from cake but at the last minute decided to use Rice Krispy Treats. The pieces were shaped while the treats were still quite warm and gotten as smooth as possible. The shaped and frosted pieces were then placed on a large board for sizing. 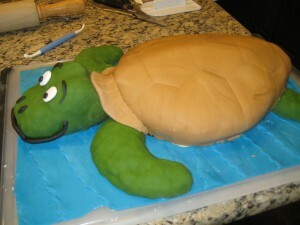 Pieces of water colored fondant rolled out and cut with a curvy tool to give an ocean looking base to the turtle. Isomalt was melted and colored to create waves. When it got to the recommended temperature it was poured over chunks of ice and cooled. It was later broken into pieces to create the waves around the turtle. 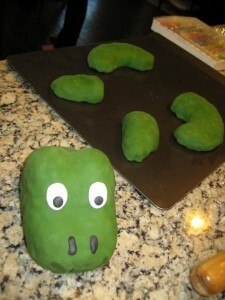 The head and legs were covered with fondant. We did not cover these in frosting before covering with the fondant because it was okay to see a little rough through the fondant. It gave a more realistic look than a smooth finish to the pieces. 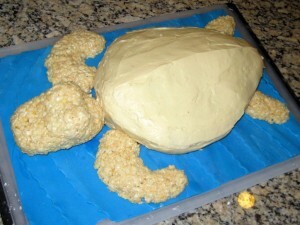 The turtle body was then covered in fondant. Lines were marked with a tool to give the shell the dimension and shapes seen on a turtle shell. Food color was used with small brushes using a watercolor method to color the shell. We started with light colors of brown and green and worked our way around adding thin layers of colors to build up and add dimension. 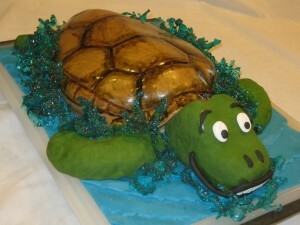 We then tucked the broken up pieces of isomalt around the turtle to create the water look. I have to admit, we were amazed at how the shell came out looking so realistic. Thanks again to my husband Ken for all his carving and shaping skills. His creativity is what makes all of these cakes come out so great.